A mother receives her annual flu vaccine injection as her daughter keeps close to her mother Friday, Sep. 22, 2017, at the Brownsville Events Center in preparation of influenza season which begins in October. It’s hard to think about getting the flu shot when temperatures are in the upper 90s outside, but health officials say members of the public should get their shots now before the flu season starts. Several pharmacies — such as Walgreens, CVS and Autrey — and clinics are already offering the flu shots and, for most insured individuals, the shots should be free. Dr. James Castillo, Cameron County Health Authority, said it is important that everyone who is able to get the influenza shot gets one. “Flu is really life-threatening … most of the people who die have their own medical issues or are elderly, and so the more people there are circulating the flu, the more likely they get it to those who are vulnerable, like babies, the elderly, or those with a pre-existing medical condition,” Castillo said. According to the Centers for Disease Control and Prevention, the flu season usually begins in October and continues as late as May. Influenza activity usually begins to increase in October and November. Health officials recommend that individuals get the flu shots every year, because the strain of the flu changes every year. Allison Mack, senior media relations specialist for Walgreens, said the myth that a person can get the flu by getting the flu vaccine is untrue. “There is no truth to the idea that someone could get the flu from the flu vaccine. The flu vaccine is made with what’s known as a dead virus, meaning it’s inactive. Occasionally, people may report mild, temporary soreness as a side effect of the vaccine,” Mack said. Mack said it’s also easier to get the flu shots since they are offered seven days a week at pharmacies like Walgreens. “Flu shots are available at all of our pharmacies during pharmacy hours, seven days a week, and around one-third of our flu shot patients come in during off hours” such as nights and weekends. The CDC recommends annual influenza vaccinations for everyone age 6 months or older. Vaccination is especially important for people at high risk of influenza complications, including pregnant women, older adults and young children. Chronic medical conditions also can increase people’s risk of influenza complications. Examples include asthma, cancer or cancer treatment, chronic obstructive pulmonary disease, cystic fibrosis, diabetes, HIV/AIDS, kidney or liver disease and obesity. “Every year it’s a different virus. It changes a little bit so it keeps being able to infect people. That’s why they change the shot every year to offer the protection. 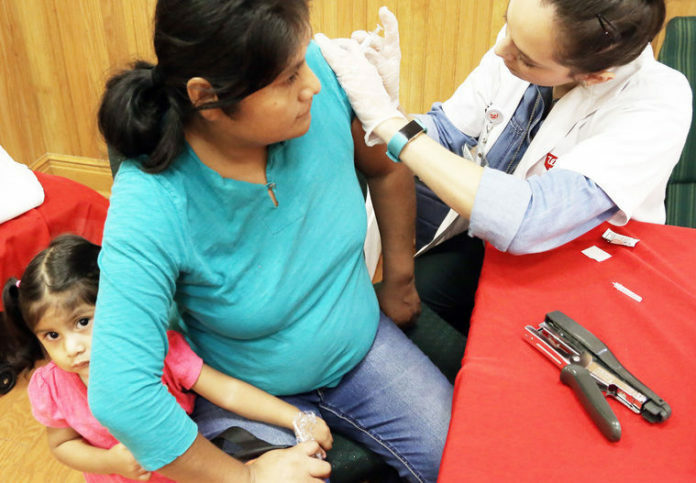 The shot won’t protect from every single strand, but it offers a lot of protection, and if it can reduce the risk by 80 to 90 percent, it’s worth it,” Castillo said.